The Held Funds Release process has been enhanced to provide flexibility when releasing holds. With this new feature, funds will now be released one group at a time. Enter the date or date range, and remove the checkmarks from groups you do not want to release, leaving only one group checked, and press the Release button. To release funds for all three groups, you will need to run the process 3 times. We hope you enjoy this new feature. Many users have asked for a way to Enter Bulk transactions, such as Tattoo or Dorm Room charges, so we are happy to announce our new Multi Transaction feature. This screen will enable you to enter multiple transactions of the same type, all at one time. You will find the new screen on the Transactions line of the main menu. When a Transaction Code is selected from the dropdown box, if a 'Default Debit or Credit' account has been defined, the system will automatically determine if the new transactions you will be creating will be either a Debit or Credit transaction to the Horseman's account. 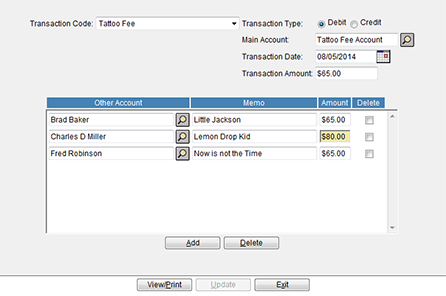 In the example below, Tattoo Fee was chosen, so the Debit Type was selected, and the Tattoo Fee Account was automatically entered in as the 'Main Account'. If you do not have a default account defined, you can manually enter the account for this batch of transactions by searching for the account in the Main Account field. You can leave the Transaction Date as the 'current' date, or choose a date from the calendar. The Amount you enter into the 'Transaction Amount' field will be the amount automatically applied to each transaction you add to this screen. You can however go in and override the base amount and manually change one of the charges to a different amount. To create your first Bulk Transaction, scan for the horseman's account in the 'Other Account' field. A memo field is provided to enter the horse name or other pertinent information. The Amount will automatically be entered from the default amount at the top of the screen. Continue adding additional transactions by clicking the 'Add' button. If you continue adding, and realize you have a blank line at the bottom or a duplicate, you can place a checkmark in the Delete column and press the Delete button to remove the selected line. After updating this batch of transactions, if you have a need to edit a transaction, you can find it under the regular Transaction Maintenance Search screen. (See online documentation for assistance if needed). Transaction codes that are created by special processes such as Race Finish, Check Printing / Voiding, insurance, and stall billing will not appear in the Transaction Code drop down because these transactions require additional information that the standard Transaction Maintenance screen does not provide. When using a transaction type that does not have a Default Debit or Credit account such as Transfer, you will need to pay special attention that you are using the appropriate Debit/Credit fields. To set a Default Debit or Credit account, go to Admin Maint / Transaction Code Maintenance. Select the transaction type and double click to open a screen where you can scan for the default account. To ensure a trouble free experience with the InCompass Solutions suite of web-based applications (Race Track Operations, Horsemen's Bookkeeper and Simo-Central) we DO NOT recommend customers upgrade to Microsoft Windows 8 or Internet Explorer 10 at this time. Based on our initial certification tests we found several compatibility issues which will prevent users from properly interacting with our applications if they are using this new operating system or browser. We are currently researching these issues and will follow up with an update when we have identified and resolved all compatibility issues. At this time our platform fully supports Microsoft Windows XP, Microsoft Windows Vista and Microsoft Windows 7 along with Internet Explorer 8 and Internet Explorer 9. If you have any questions or concerns please don't hesitate to contact our Technical Support team at (800) 625-4664. Adobe recently released a new version of their Adobe Reader software that is utilized by the RTO system for printing reports. After upgrading you may find that your system sometimes displays a blank gray screen when you attempt to generate a report or print checks. You can quickly resolve this issue by opening Adobe Reader X via the Start Menu on your PC and accepting their new updated license agreement. This should be a one-time process after which you should be able to generate reports normally. If you have any questions or concerns please don't hesitate to contact our support team via email, fax or phone. We have installed a new 'Retrieval' screen on your RTO HB menu and want to tell you how this will function. Large reports that require a lot of processing time, will now be scheduled to run the in 'background' and appear in the Retrieval screen for you to view. Currently we have the Account Balance Detail Report setup to generate in the background, so you will not see Adobe Acrobat opening with the Generating ... message. Instead you will get a message stating the report is generating and will be available in the Retrieval screen. The report will still take several minutes to generate, so just wait a little while and then go to the Retrieval screen and you should see a pdf link to your report. Inside you will find several pdf links that will retrieve a copy of your Account Balance Detail Report. We now have the ability to schedule certain reports to generate in the middle of the night and be ready for you in the morning. If you would like to have the Account Balance Detail Report automatically generated every day / week / month, please let us know your preference and we'll set that up for you. We can also include any other custom reports you run frequently that take a while to generate. Let us set these up to run in the early morning hours, and be waiting for you when you login. The reports will remain in this screen for 7 days, or until you manually Delete them. TIN Matching is a free pre-filing service offered by eServices of the Internal Revenue Service; to payers of income subject to backup withholding. The program is completely voluntary. TIN Matching assists the payer in determining if the payee TIN/name combination contained on their Form W-9; matches the TIN/name combination contained in IRS tax filing records. The benefit to using this service is to be notified of potential TIN errors that can be corrected before filing your 1099 data and eliminate or reduce penalties currently assessed at $50 per incorrect return. InCompass now enables you to create a Bulk Tin Matching file, which is uploaded to the IRS site for inspection. In a day or two, you will receive an email indicating a response is waiting. You can view the results of this file via the RTO System. The purpose of this message is to inform you of this new capability; and to provide instructions on how to use it. Step 1 is to apply for an IRS Payer Account. Users must register online with eServices and create a username, password and PIN that will enable you to access the system electronically. Once the online registration is completed, you will receive a confirmation token at your home address. You must validate online within 28 days of the initial registration. Once you have been established as a user on the TIN Matching system, you will log in with the username and password established during the registration process. Upon login, users must accept the TIN Matching Terms of Agreement. You will then be prompted to enter a TIN Type, TIN, and Name to be matched against IRS records. Potential users are encouraged to begin the registration process for an IRS Payer Account (PAF) using the link to the IRS website below. Note: as part of this registration you will be asked for your Adjusted Gross Income (AGI) from your most recent individual income tax return in order to verify your identity. 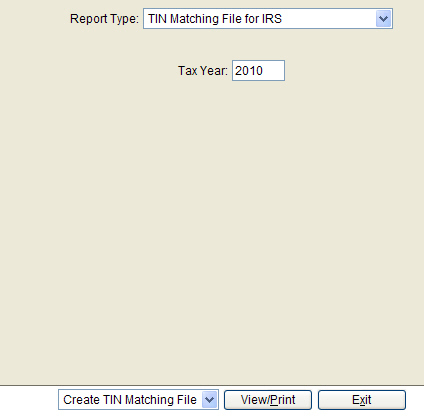 Step 2: From the Main menu, go to the Tax Reports menu, and choose the Report Type: TIN Matching File for IRS. 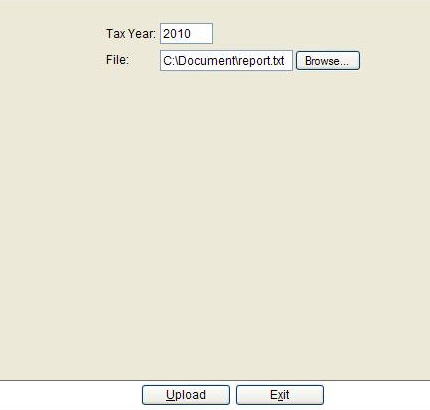 Enter the tax year you will be filing; and then click View/Print. The process creates a file formatted per IRS guidelines of accounts that will receive a 1099 for the specified tax year. 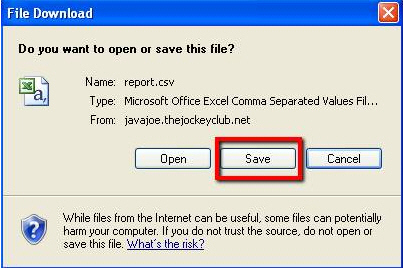 When completed, you will be prompted to save a copy of the file to your desktop. Use this file to upload your accounts to the IRS for TIN Matching. Using the link below, you will login with your Payer Account information and choose to upload the file you created from the RTO system and saved to your desktop. Within a few hours, an email will be sent to you indicating a response is waiting. You will have 30 days to access and download the results file. Once accessed, the results are retained for three days before being purged. After you have retrieved the results file from the IRS, save a copy to your desktop. Now you are ready to upload this file to the RTO System to view your results. Step 3: From the Main menu, go to the Tax line and choose TIN Results. Enter the Tax Year, and Browse to locate the file you retrieved from the IRS TIN Matching site. Click Upload and your file will be processed into the RTO System. 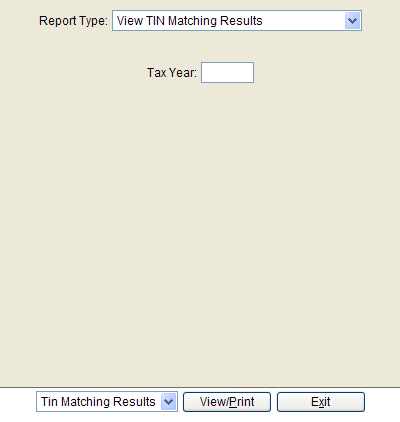 To view your results, go to the Tax Report Menu, and choose the Report type: View TIN Matching Results. Below is an example of the Results you will receive. Every account will be listed, with the problem accounts on the first few pages. Any account that does not say, 'TIN and Name combination matches IRS records' should be contacted to obtain the correct Account Name or TIN Number. Correct the data in the Horsemen Maintenance screen, and remember to run the 'Generate Tax Info' process before creating another file to upload to the IRS. There is no limit to the number of times you can submit a new file for TIN Matching. On the TIN Matching website, you also have the option to enter individual TIN/Name combinations to verify single horsemen if you want to do a "Print Screen" and file each printout with the payee's records in order to establish due diligence. InCompass realizes that password management is becoming more of a challenge every day. Many of us manage multiple passwords to conduct our business and personal activities including our email account, online banking accounts and access to the InCompass RTO system. To make password management easier at the racetrack, InCompass has enhanced its password management functionality. The new functionality will give on-track personnel the ability to manage RTO Users access. The ability of on-site personnel to be able to reset passwords should be a tremendous time-saver for RTO users at the startup of each new meet. Many times passwords have expired, or access was de-activiated at the end of the previous meet and contacting InCompass was the only way to update user's access. We can authorize someone at your site with this ability. We are requesting each site designate one or two people with the authority to reset passwords as well as Activiate/Deactivate RTO user access. Effective Wednesday, March 31st, InCompass will implement a change to the way Account Names / Tax Names appear in the Horsemen Maintenance screen. Currently, the two screens are linked and if a name is updated on the Account Information tab (1st screen), the name is also updated on the Tax Information tab (2nd screen). To allow for better record-keeping, we will remove the link between these two tabs. This will allow you to make changes to the way the name is displayed on printed reports and statements without affecting the official tax name on the Tax Information screen. In this example, Julianna is the name attached to this Social Security Number and must be entered this way for IRS purposes. Please review these upcoming modifications and notify us should you any questions or concerns. InCompass has been approached by the Jockeys' Guild, Inc. (the "Guild") with a request to streamline the process of updating their system with the payments that your racetrack sends to the Guild each week. The Guild has asked InCompass to provide them with an electronic file containing summary Guild fee payments via InCompass' Race Track Operations (RTO) system. InCompass recognizes that the transaction information in our system that relates to your racetrack is owned by you and we will not supply any of it to an outside party without your permission. With this in mind, we would like to know if you wish to grant the Guild's request and permit InCompass to export a summary of Guild fees collected via your Horsemen's Bookkeeper system. This file would contain the following information: jockey name, account number, total mounts and total Guild fees collected. The goal of this approach is to eliminate the need for the Guild to manually key payment information into its systems each week. The Guild will have absolutely no direct access to your racing or horsemen's bookkeeper system or database. 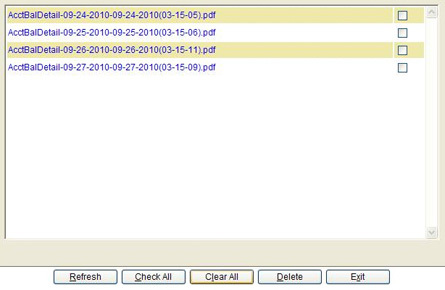 InCompass will simply provide a summary file based on a date range requested by the Guild. Of course there would be no charge to your racetrack for this service. We would appreciate either an affirmative or negative response to this email to inform us of your preference. A new report has been added to the RTO HB System to help the bookkeeper identify horsemen accounts with incomplete or invalid Tax Names and Tax ID Numbers. The new Horsemen Tax Information Report is located under the Horsemen Reports menu. The report lists each Account, and then displays either the matching SSN / Managing Owner pair or the Fed ID / Partnership Name pair, along with which Tax ID number to use and whether or not a W9 form is on file for this account. The use of this report should help eliminate the transmission of erroneous data to the IRS which could result in a fine of $50 for each wrong account. Account Types - The report can be generated for All Accounts, or selected groups. Activity Date Range - Enter the beginning and ending date ranges here. Because of the large volume of data that could be retrieved, some options are limited to a 3 month date range. When the report is generated, the system will perform several validations and identify accounts with possible problems. All accounts highlighted in red must be corrected. There could also be other problems that the system cannot automatically identify, but can be seen when reviewing the report. An example of this will be detailed below. On the following example, it is easy to see at least 3 accounts that have problems and need to be corrected as they are bolded in red. Account 10086 - The SSN/Managing Owner pair is entered correctly; however, the Account is set to use Federal ID number which is not present. Account 10102 - The report indicates they want to use the SSN as their Tax Number. If you go to the Horsemen Maintenance, Tax Information Tab on their account, the 'Partnership Name' is selected as the Tax Name to use. Select 'Managing Owner' as the Tax Name and the account will not appear in red the next time the report is generated. Account 10226 - The Tax Number/Tax Name pair does not match. If this account will be using a Federal ID number, the Managing Owner name should be deleted and a Partnership Name should be added. Horsemen Maintenance Screen - Tab Account Information. The account is setup correctly here as a partnership account as indicated by Entity set to 'Yes'. No problems on this screen. Horsemen Maintenance Screen - Tab Tax Information. Since this is a partnership between two owners, one of them must become the Managing Owner. You must determine if the Social Security Number 222-22-2222 belongs to Mr. Malouf or Mr. Broome. This information can be obtained from the W9 form. The First Name, Middle Initial (if used) and Last Name should be entered into the Managing Owner fields. The Managing Owner radio button should also be selected as shown below. If you have any questions or concerns, please contact us at HYPERLINK "mailto:techsupport@incompass-solutions.com"techsupport@incompass-solutions.com; or by phone at (800) 625-4664 (press 3). Please feel free to contact our technical support team via email at techsupport@incompass-solutions.com or by phone at (800) 625-4664, press 3, if you have any questions or concerns regarding these changes. With the 1099 tax season upon us, we would like to touch base with you regarding the processing of your 1099's for 2008. On line documentation for all of the tax processes are available on your RTO Menu, in the Help Doc section. There are a few tips we'd like to mention here as well. The Tax Verification Report is a good starting place to ensure all accounts contain complete information. This report is located under the Tax Forms menu. Before printing any forms, the system requires that you run the Tax Verification process. This process checks to make sure each account contains a Tax ID, Address, Tax Name and IRS Code. If any account appears on this report, you need to view the account in Horsemen Maint, and correct the information indicated with an 'N' on the report. Once the missing data has been corrected on the account, you must run the Generate Amounts process again, so the system recalculates all the information. Make sure that there are NO accounts appearing on the Tax Verification report before printing the 1099 forms, or creating the Tax File. Any account that remains on the Tax Verification report is subject to a $50 fine by the IRS. As a normal practice, we recommend that you print a few tax forms to ensure the information and forms are laid out as you like, before printing an entire batch. You have the capability to test the 1099 file with the IRS prior to submission. We would like to invite you to follow the IRS FIRE (Filing Information Returns Electronically) instructions below when you are ready to process your 1099 file. This step is very helpful to ensure all data is submitted free of errors. This year the FIRE site will be available starting January 5th through February 13th. The process of creating the 1099 file, downloading the data and testing via the FIRE site can be done by you and/or your IT staff. If you would like InCompass to do the testing for you, we will do this for a charge of $250.00. If you want us to test the 1099 file for you, please notify us by February 8th so we can receive the results back by February 15th. As always, if you have any questions or concerns, please contact us at techsupport@incompass-solutions.com, or contact by phone at (800) 625-4664 press 3. The IRS requests returns be filed using the electronic filing system. The FIRE (Filing Information Returns Electronically) site is https://fire.irs.gov. This is the same site we have been using to submit your test files. If you currently use the FIRE site to file your returns electronically, you will continue to do so. If you do not use the FIRE site, you will need to create a user name and password and have your TCC and EIN numbers available. These numbers can be found on the Admin Maint -> Facility Configuration -> Tax Information tab in HB. For those of you who have already received 1099 diskettes from us, you can still use the file on the diskette for uploading to the FIRE site. For those who still need a 1099 tax file, we will be happy to generate the file and send it to you via email or Fed Ex on a diskette for uploading to the FIRE site. Instructions for using the FIRE site are below. These instructions are from the IRS Publication 1220. This publication can be found on the IRS site at http://www.irs.gov/pub/irs-pdf/p1220.pdf. 01 Point your browser to http://fire.irs.gov to connect to the FIRE System. 02 Filers should turn off their pop-up blocking software before transmitting their files. 03 Before connecting, have your TCC and EIN available. 04 Your browser must support SSL 128-bit encryption. 05 Your browser must be set to receive "cookies". Cookies are used to preserve your User ID status. Click "Create New Account". Fill out the registration form and click "Submit". Enter your User ID (most users logon with their first and last name). Enter and verify your password (the password is user assigned and must be 8 alpha/numeric, containing at least 1 uppercase, 1 lowercase and 1 numeric). FIRE may require you to change the password once a year. Click "Create". If you receive the message "Account Created", click "OK". Enter and verify your 10 digit self-assigned PIN (Personal Identification Number). Click "Submit". If you receive the message "Your PIN has been successfully created! ", click "OK". Read the bulletin(s) and/or "Click here to continue". Click "Log On". Enter your User ID (most users logon with their first and last name). Enter your password (the password is user assigned and is case sensitive). At Menu Options: Click "Send Information Returns" Enter your TCC: Enter your EIN: Click "Submit". The system will then display the company name, address, city, state, ZIP code, phone number, contact and email address. This information will be used to contact or send correspondence (if necessary) regarding this transmission. Update as appropriate and/or Click "Accept". Enter the alpha character from Form 9267, Media Tracking Slip, that was sent with the request for replacement file. Click "Submit". Enter your 10 digit PIN. Click "Submit". Click "Browse" to locate the file and open it. Click "Upload". If you have more files to upload for that TCC: Click "File Another? ", otherwise, Click "Main Menu". It is your responsibility to check the acceptability of your file; therefore, be sure to check back into the system in 1-2 business days using the CHECK FILE STATUS option. At the Main Menu: Click "Check File Status". Enter your TCC: Enter your EIN: Click "Search". "Good, Not Released" and you agree with the "Count of Payees", you are finished with this file. The file will automatically be released after 10 calendar days unless you contact us within this timeframe. "Good, Released" - File has been released to our mainline processing. "Bad" - Correct the errors and timely resubmit the file as a "replacement". "Not yet processed" - File has been received, but we do not have results available yet. Please check back in a few days. Click on the desired file for a detailed report of your transmission. When you are finished, click on Main Menu. Click "Log Out". Close your Web Browser. A new Contact Us link has been added to the top of the RTO screen to make it easier to get in touch with us regarding an issue or new request. This service provides a way for you to contact us from within the RTO System without having to open your email and compose a message. Please complete the following screen with as much detail as possible. The more details provided, the quicker we will be able to research the issue and provide an answer. Choose the module you are working with: Racing, Horsemen's Bookkeeper, Media or Futurities. Provide contact information such as your phone number and email address. Enter a Subject to identify the topic, and then provide as much information as possible under the Issue section. Complete this section with details such as the exact error message, troubleshooting ideas you've already attempted, or a description of a new feature you would like information about.If the problem is specific to a Race Date, Horse or Horseman account, please complete the Pertinent Details section. The screen name can be found in the top right hand corner of the RTO screen. In the example above, the screen name is: I001-4. The exact program name is helpful as we have several 'program reports', (ie; 4x9, 4x9 with pp's and 8.5x11) and need to know which one you are referring to. All requests will be answered in a timely manner during regular business hours. Should you use the Contact Us messaging system after-hours or on weekends, the system will prompt you to choose between needing 'Immediate' attention (resulting in the On-Call person being contacted), or schedule a response on the next business day. We hope you find this new feature helpful, and user-friendly to use. As always, we can still be contacted via email, fax or phone as listed below. Enhancements have been made to the Race Finish process so purses that are held for 48 or 72 hours can now be released to the hour instead of at the beginning of the day. The automatic release process will calculate when to release the purses based upon the post time of the race. The Race Convert process has been modified to pull in the Post Time of the race from the Post Time setup in the Racing Office. A new 'Post Time' field will now appear on the header of each race on the Race Convert / Race Setup and Race Finish screens. 1. Go to Admin Maint / Facility Configuration / Default Tab. Scroll down until you see the Race Transaction Clear at Post Time checkbox. Make this process active by clicking in the checkbox. 2. Go to Admin Maint / Hold Types. Set the Purse hold to the number of days required. 3. Go to Admin Maint / Transaction Code Maintenance. Select the PU - Purse Transaction line, and then press enter. Change the Hold Type to 'Purse'. as AM for added money, BC for Breeders' Cup, SF for State Fund, etc. With these changes in place, purses will clear at the post time listed on each race, for the number of days out specified on the Purse Hold. If you have any questions or need assistance implementing this functionality, please feel free to contact us. Since starting to print the Breeders Cup Payment Verification Forms, It has come to our attention bookkeepers have to change the purse and Breeders' Cup purse on the race header to make the calculations on a "Guaranteed" Breeders' Cup race come out correctly. The system takes the amounts that appear in the purse and Breeder' Cup purse fields on the race header and prints them on the Payment Verification Forms. Therefore, it is important that these numbers correctly represent the race and are not changed to allow the transactions to calculate correctly. InCompass has modified the calculations that take place on "Guaranteed" races that have Breeders' Cup money. These changes will only affect "Guaranteed" races and will only affect the earned purse and earned Breeders' Cup transactions (transaction codes "PU" and "BC"). Below is a summary of how the two transactions will be calculated. Step 1 - The system will determine what percentage of the total purse the Breeder' Cup is contributing. This will be done by dividing the Breeders' Cup purse by the Total Purse. Step 2 - The system will calculate how much of the Horsemen's Fees (Start Fee, Entry Fee, and Nomination Fee) was paid by owners of Breeders' Cup eligible horses. Step 3 - The system will calculate the Breeders' Cup portion of the Horsemen Fees. This will be done by multiplying the amount found in step 2 (fees paid by Breeders' Cup eligible horses) by the percentage found in step 1 (Breeders' Cup Percentage of Total Purse). Step 4 - The system will determine what portion of the Breeders' Cup purse will be used to calculate the "BC" transactions. This will be done by subtracting the amount found in step 3 (Breeders' Cup portion of Horsemen Fees) from the Breeders' Cup purse. 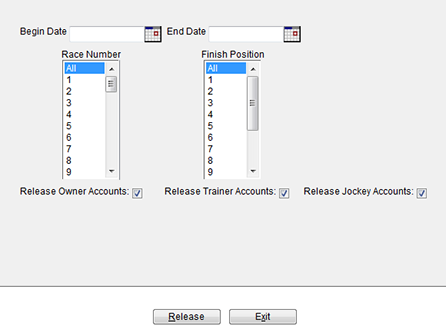 Step 5 - The system will calculate the earned Breeders' Cup money ("BC" transaction amounts). This will be done by multiplying the Breeders' Cup purse split percentages for each finish position by the amount found in step 4. Step 6 - The system will calculate the non-Breeders' Cup portion of the Horsemen Fees. This will be done by subtracting the amount found in step 3 (Breeders' Cup portion of Horsemen Fees) from the total amount of Horsemen Fees (total amount of start, entry, and nomination fees paid by ALL owners). Step 7 - The system will determine what portion of the Total Purse will be used to calculate the "PU" transactions. This will be done by taking the Total Purse and subtracting the Breeders Cup purse and the amount found in step 6 (non-Breeders' Cup portion of Horsemen Fees). Step 8 - The system will calculate the earned purse ("PU" transaction amounts). This will be done by multiplying the Purse split percentages for each finish position by the amount found in step 7. The "AM" (added money) transactions will remain unchanged. If you have any questions about the above calculations, please feel free to call InCompass at (800) 625-4664 or reply to this email. With the 1099 tax season upon us, we would like to touch base with you regarding the processing of your 1099's for 2007. We have the capability to test the 1099 file with the IRS prior to submission. We would like to invite you to contact us when you are ready to process your 1099 file, so we can test the electronic data for any errors. Please make sure you notify us that you are ready for the IRS electronic submission test prior to February 8, so we can provide the IRS test results to you by February 15. This step will be very helpful to ensure all data is submitted free of errors. As always, when you are ready to complete your 1099's, contact InCompass Tech Support so we can download the file to a diskette or CD for you. Two reports have been enhanced and are available for use. They are the Trainer Checkout Report and the Owner/Trainer Race Report. The Trainer Checkout Report was accessible to only a few bookkeepers. An enhanced version has been added to the Transaction Reports menu for all to use. The second report is the Owner/Trainer report. New features to this report calls for the report to be renamed to the Horsemen's Race Report. Descriptions and examples of each of these two reports follow: Trainer Checkout Report - Transaction Report Menu The Trainer Checkout Report has been used by only a few bookkeepers and was placed in the Custom Reports menu. A new version of this report has been added to everyone's menu under Transaction Reports. The Trainer Checkout report is helpful when checking balances of a trainer's owners. The report get's its name from bookkeepers needing a list of all owners and their balances by trainer so they could make sure none of the accounts were negative before the Foal Certificates were released from the Racing Office. The report will show all owners that have raced a horse with a specific trainer, and their current balance. Also included are the owner's earnings, number of horses, and number of starts for the date range entered. The report can be run for an individual Trainer, or for All Trainers, as well as for any date range. .
A new "Link To" button has been added to the Horsemen Maintenance screen on the Race Convert Name line. In the past, if an HB account was incorrectly linked to the wrong Racing (Equibase) account, you had the ability to clear the link, but then you had to wait until the horseman was entered into a new race before you could establish the new link via the Race Convert Process. Now you can immediately re-link the account to the proper Equibase account but using the 'Relink' Button. . The Held Funds Maintenance module has been enhanced to allow the bookkeeper to mark money on hold as taxable and to defer the tax liability for the held amount until the tax year in which the funds are released and received by the horseman. The amount will be deducted from the taxable earnings in the year the money was held and will be added to the taxable earnings in the year the money is released. We are preparing to launch a new product called Financial Services via the HB Account Access website. Financial Services will allow the horsemen to transfer money in their HB Accounts between participating race tracks or into their personal bank account. We made several system wide changes in the Bookkeeper's System to accommodate this new service. A new menu line has been added to the Horsemen Bookkeeper's Menu entitled 'Financial Services'. This menu line contains a new screen entitled 'Transfer Funds' and a Report menu. Bookkeepers of tracks that are using the Financial Services use this screen to review transfer of funds requests. Two additional lines have been added in the Balance section of the Horsemen Maintenance screen. One for Pending Web Checks and the second for Pending Web Transfers. Both Web Checks and Web Transfers can be made by the horsemen via the HB Account Access website that many horsemen across the country are using. In the example below, a Web Transfer in the amount of 10,008.00 is pending, and therefore has been deducted from the total Available Balance in the account. We've changed the name from 'Owner of Record' to 'Managing Owner' and added a comment of 'Authorized Web Transfer' which denotes that the person entered here is the 'Authorized' partner for initiating money transfers between tracks or into their personal bank account. In the Transaction Code Maintenance screen, for each transaction type containing a Clear Date, you can now specify a Clear Time. RTO currently supports 800x600 screen resolution which limits the size we can expand the Main Menu. Therefore, we have made a change to the font on the Main Menu. The new font will allow us to add menu options in the future without having to remove other menu options. The Check Reconciliation process has been moved to a new menu line of it's own entitled 'Bank Recon' and removed from the 'Checks' menu line. The Check reconciliation function has not changed, except it's been renamed to 'Entered Items'. An enhanced Bank Reconciliation module which can be used to reconcile bank deposits and adjustments is now available. For pricing of these new enhancements to the new Bank Reconciliation module, please contact Brad Kimbrell at (800) 625-4664 or (859) 296-3007. InCompass is proud to announce a new free enhancement which gives horsemen an additional option to enter their check requests via the internet rather than via phone or in person. This enhancement will be available to all HB Account Access subscribers. The HB Account Access system provides horsemen with real-time access to their detailed statements, account balances, tax forms and now the ability to request a check through a secure Internet connection. A new balance category entitled 'Pending Web Checks' has been added to the Horsemen's Maintenance Account Information screen. 'Pending Web Checks' will display the amount of checks requested by horsemen. Although Online Check Requests via HB Account Access is an optional service, even non-participating racetracks will see a "Zero" in the Pending Web Checks field. HB Account Access enables racetracks to realize operational efficiencies in their HB office and provide a unique service to their horsemen. By providing horsemen with convenient 24-by-7 access to their statements and balances, HB Account Access lessens the many external demands placed on horsemen's bookkeepers. Racetrack personnel may contact Brad Kimbrell at (800) 625-4664 or (859) 296-3007 to learn more about the HB Account Access service. A new Negative Balance Report feature has been added to the Account Balance Detail Report in the Horsemen's Bookkeeper System. Please feel free to contact our technical support team via email at techsupport@incompass-solutions.com or by phone at (800) 625-4664, press 3. New Horsemen's Bookkeeper Validations have been added to the system similar to the validation messages that have been available on the Racing side. All of these validations can be overwritten, but appear as warning messages when certain events take place. A new feature has been added to the Statement Menu for use in printing Negative Balance Statements. The system will now automatically calculate the beginning date the account went negative and display that date and all the transactions up to the current date. From the 'Statements For' dropdown box, chose the type of statements you want to print. Balance Type must be set to Negative for this feature to work. Activity Type can be any of the options, but we suggest 'All' to produce the most complete details. Activity Start and End date fields can be ignored, as the system will automatically calculate these dates for each individual account. Include Type can Include or Exclude Inactive Accounts. Print From / Print To fields should be set at the default setting of A to Z. The system will search through all negative accounts as defined on the previous screen, and display all accounts with a negative balance. The Begin and End Date fields on this screen can be ignored as the system bypasses these fields for this operation. Press the 'Print Dated Statements' button. To set up default Statement Dates go to Admin Maint -> Client Configuration and also Facility Configuration on the Reports tab. Also as of April 1st The Jockey Guild has increased the Jockey Guild Membership fees to $11 for Full Membership and $4 for a Partial Membership. These changes can be made by going to Admin Maint -> Race Finish Deductions, and updating the Full Guild Fee and Partial Guild Fee fields.